When France began mining uranium ore in the desert of northern Niger in the early 1970s, Arlit was a cluster of miners’ huts stranded between the sun-blasted rocks of the Air mountains and the sands of the Sahara. The 1973 OPEC oil embargo changed that. France embraced nuclear power to free itself from reliance on foreign oil and overnight this remote corner of Africa became crucial to its national interests. Arlit has grown into a sprawling settlement of 117,000 people, while France now depends on nuclear power for three-quarters of its electricity, making it more reliant on uranium than any country on earth. Niger has become the world’s fourth-largest producer of the ore after Kazakhstan, Canada and Australia. But uranium has not enriched Niger. The former French colony remains one of the poorest countries on earth. More than 60 percent of its 17 million people survive on less than $1 a day. Now Niger’s government is demanding a better deal from Paris, and specifically from state-owned nuclear company Areva. The two sides began talking more than a year ago but failed to clinch an agreement before Areva’s 10-year mining contracts expired on December 31. Areva suspended production at its two sites in Niger in mid-December: the open-cut Somair mine at Arlit and giant underground Cominak pit nearby. The company says the closure was for maintenance but Synamin, a union that represents mining workers, called it a negotiating tactic. Production resumed at the start of February. Areva and Niger’s just-expired agreements have never been made public. But Reuters has reviewed documents which reveal that Areva’s mines pay no export duties on uranium, no taxes on materials and equipment used in mining operations, and a royalty of just 5.5 percent on the uranium they produce. A spokesman for Areva declined to confirm the authenticity of the documents and did not comment on their contents. Niger’s President Mahamadou Issoufou says the deals are a throwback to the post-colonial era, when France played a dominant role in the economies of its former African territories. His government wants to cut the tax breaks and raise the royalty rate – its largest source of income from the mines – to as much as 12 percent. That would be more than the 5 percent charged by most Australian states, but bring Niger into line with the 13 percent charged by Canada’s uranium-producing province of Saskatchewan over the past decade. In Kazakhstan, the official rate is 18.5 percent. Areva produces uranium in both Canada and Kazakhstan but would not detail the royalties it pays in those countries. (It explores for uranium in Australia but does not mine it there). Mining Minister Omar Hamidou Tchiana, leading the negotiations for Niger, told Reuters the government wants to increase uranium revenues to at least 20 percent of the budget, from just 5 percent at present. Areva, which produced nearly one fifth of the world’s uranium in 2012, says a higher royalty rate would make its business in Niger unprofitable. With uranium prices down about 70 percent from their peak in 2007, a diplomatic source in Paris said Areva would not agree to a big increase in what it pays Niger. “Niger needs to take into account that Areva is not in great financial health and that the uranium price is low and not about to increase anytime soon,” said the source. A new deal is important for Areva, but vital for Niger. With global revenues of 9.3 billion euros ($12.56 billion)in 2013, the French firm is almost twice as big as Niger’s entire economy according to the IMF. Loss-making and with net debts of nearly 4 billion euros, it is still Niger’s biggest private employer and its largest exporter. Areva does not provide a profit breakdown for its operations in Niger but says its current deal with the country is fair. It says that over the past 40 years Niger has received around 80 percent of ‘direct benefits’ – taxes and dividends – from its two uranium mines, with Areva taking the rest. It estimates that its mines paid a total of 82 million euros to Niger in dividends and taxes in 2011, and 123 million euros in 2012. However, the Extractive Industries Transparency Initiative (EITI), a global coalition of governments, including Niger’s, and of companies seeking to improve the accountability of natural resource revenues, estimates Areva’s mines paid a total of 66.3 million euros to Niger in 2011. 2012 figures are not yet available. * Exempt from any export duties on its uranium production. * Exempt from all entry taxes, customs duties and value-added tax, on materials, equipment, machines, parts and petroleum products used in mining operations, including everything from sulfur and other chemicals used to process ore, vehicles, and even protective clothing. * Protected by a stability clause so that an increase in royalties tax under a new 2006 mining law did not affect them. * Protected so that if another uranium miner negotiated better terms, Areva would automatically benefit from the same conditions. * Guaranteed that any audit of the mines ordered by Niger will remain strictly confidential. * Granted an exoneration of up to 20 percent of corporate income tax to help fund future prospecting. Areva held a monopoly over uranium mining in Niger until 2007. Its sole competitor, Somina, a joint venture between the government and the overseas arm of the China National Nuclear Corporation, was launched a year after the introduction of a 2006 mining law that sharply reduces tax breaks. Mining Minister Tchiana said Areva’s tax breaks cost the government 23 million to 30 million euros a year in potential tax revenue, and any new contracts will have to adhere to the 2006 law. The Areva spokesman said the tax breaks were important to encourage research and development in the mining sector and to allow its mines to continue production despite depressed uranium prices and rising production costs. He said the mining companies pay the standard corporate tax rate of 30 percent. Unions in Niger and transparency campaigners say Areva has also become more aggressive about minimizing its profit – and thus its tax bill – in the country in the past few years. A confidential Niger Mining Ministry document seen by Reuters shows production costs at the Somair mine doubling in just five years, from 19,783 CFA francs ($40.75) per kilogram in 2006 to 40,146 CFA francs per kg in 2011. At Cominak, costs per kg rose from 27,277 CFA francs to 45,603 in 2010, the undated document showed. “Our objective is to lower these production costs so that Niger can profit more,” said Minister Tchiana, adding that the government had commissioned an independent audit of Areva’s Niger operations. The report, by Netherlands-based consultancy BearingPoint, has not been made public. Areva strongly denies artificially hiking costs. It says higher charges are due to the complex technical characteristics of new ore deposits that have helped increase production by one-third in the last five years, as well as to a rise in the cost of fuel for vehicles and machinery and of sulfuric acid used to process uranium. 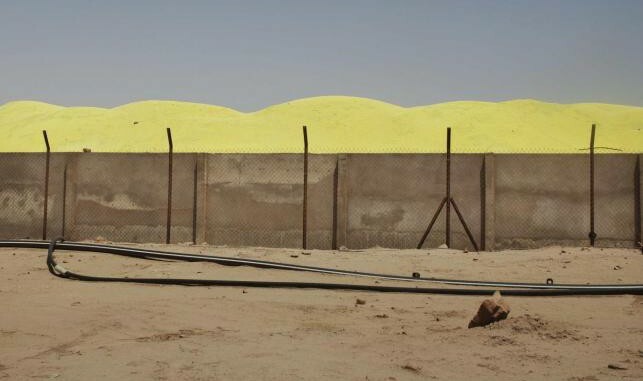 At the Somair mine outside Arlit, lumbering yellow trucks work round the clock hauling grey-green ore from the bottom of vast 100-metre-deep pits. The ore ends up in a processing plant where it is turned into yellowcake. At night, stadium lights illuminate the pitch-black of the desert, while the metallic clanging of the plant’s grinder cuts the silence. The just-expired contracts state that Areva would provide electricity and water to Arlit and help maintain the road linking it to the town of Tahoka, more than 300 miles to the south. Yet the road is all but impassable for long stretches, forcing trucks to drive in the desert sands, where some wrecks lie rusting. Areva says it has given 1 percent of the revenues from its mines annually to a government body responsible for maintaining the road, meeting the terms of its contract. By night, much of the town is in darkness. An Areva water tower does supply the town, though residents – who are not entitled to free water or power under the terms of Areva’s contract – pay the state water company. Some in Arlit feel angry that the mine has not brought greater prosperity. Around 2,000 mine employees live in neat estates, with a clubhouse and restaurants. The rest of the city is dirt-poor, with unpaved streets and ramshackle mud-brick homes. Officials and NGOs often point to high levels of corruption as a reason for poor delivery of services. Local governments – which benefit from a 15 percent share of the royalties tax under the 2006 mining law – complain that payments are more than two years overdue. Local officials say the mining companies pay the royalties to the central government every month, and the delays are Niamey’s responsibility. Mining Minister Tchiana declined to comment on this, saying it was a finance ministry issue. A spokesman for the ministry did not respond to requests for comment. Niger has a turbulent political history marked by rivalries and coups, and even though Issoufou’s government has made progress in tackling corruption, the country still ranks 106th out of 177 countries in Transparency International’s annual corruption perceptions index. Still, Rhissa Feltou, mayor of the regional capital Agadez, says Areva’s two mines do too little for development in the north. The firm says it does plenty, spending 6 million euros a year on health and economic development projects in Niger. There is no public hospital, but the mines allow residents access to their clinics free of charge. Areva has also built and renovated local schools. “We contribute directly through the jobs we are creating and we generate taxes for the state budget. This is our contribution, but we cannot do everything,” Areva chief executive Luc Oursel told Reuters. One key sticking point is how to calculate the official price of uranium. That is used as a basis for all royalties, taxes and profits and Niger wants to set it as high as possible. For the past two years the agreed price has been 73,000 CFA francs ($150) a kg, nearly double the current spot price of around $80. Areva wants the new deal to be based on a formula using spot market and long-term contract prices, rather than political negotiations, according to the leaked minutes of a 2012 meeting signed by both sides. The price would change depending on the spot price on world markets, according to the minutes, which say this is Areva’s proposal. Areva has not confirmed the authenticity of the document. Niamey does seem to have had some success in squeezing extra money from Areva. The minutes of the meeting show that Areva agreed to pay Niger an extra 35 million euros over three years from 2013 in compensation for delays to a giant uranium mine it is building at Imouraren in northern Niger. President Issoufou insists that mine, which will provide thousands of new jobs, must start production before he runs for re-election in 2016. Areva’s Wantz said publicly in March that the fee was to pay for security – even though the current contract says the safety of the mines is Niger’s responsibility. Security is certainly a big concern. Seven people connected with a Somair project were kidnapped in 2010 by al Qaeda’s local wing, though all have since been released. In May, the Somair mine was attacked by al Qaeda-linked suicide bombers, and the region is now crawling with military. Some European contractors have pulled out altogether and northern Niger is considered a no-go zone for Europeans. The Islamist threat has placed a huge strain on Niger’s budget, upping the stakes in the talks. “We need to control the north of Niger more and, for that, we need infrastructure for which we must be aided by our international partners,” Foreign Minister Mohamed Bazoum told Reuters. The question for Issoufou is how hard he pushes President Francois Hollande on a new deal. Trained in France as a mining engineer, Niger’s president is a longtime democracy activist who has known Hollande since their days in the Socialist International together. Issoufou even worked for Areva at one of the mines between 1985 and 1992, including as Secretary General. Issoufou started pushing for a better price for Niger’s uranium almost as soon as he was elected in 2011. But despite what the French diplomatic source describes as a “relationship of trust” between Issoufou and Hollande, Niger’s new demands have raised hackles in Paris. “The climate that has developed between the two parties is not very good,” the diplomat said. Issoufou said in December that the talks were progressing “normally” but has suggested Niger may turn to other countries – he did not say which – to help extract its mineral wealth. The contract negotiations are front page news in Niger and there have been strikes and demonstrations against Areva. A glance at Niger’s budget explains why it matters. Western aid accounts for nearly 40 percent of the state budget, much of it from France; as a percentage of GDP, Niger’s tax revenues are the lowest in West Africa according to the IMF. “Today Niger is faced with the power of France. Niger is not negotiating with a company,” said Ali Idrissa, head of ROTAB, the local arm of transparency campaigner Publish What You Pay.